The animation and 3D effects are extremely impressive but the story drags terribly and fails to engage on an emotional level, whilst parts of it may prove too frightening for young children. Adapted from the classic story by Charles Dickens, Disney’s A Christmas Carol is directed by Robert Zemeckis, who uses the same animation techniques that he used with The Polar Express (so that the animated characters closely resemble the actors portraying them). Jim Carrey plays Victorian miser Ebenezer Scrooge, who hates Christmas and is insufferably mean to everyone around him, including his kindly nephew, Fred (Colin Firth), and his assistant, Bob Cratchit (Gary Oldman). On Christmas Eve, Scrooge is visited by the ghost of his recently deceased business partner, Jacob Marley (Oldman again, though the character bears an uncanny resemblance to Phil Daniels), who tells him he'll be visited by three more ghosts, The Ghost of Christmas Past (Jim Carrey), The Ghost of Christmas Present (Jim Carrey again) and The Ghost of Christmas Yet To Come (Carrey again). 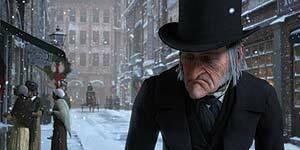 Will mean old Scrooge mend his ways in time for Christmas day? Technically speaking, the animation is extremely impressive, whilst Zemeckis makes good use of the 3D effects, particularly when the ghosts show up. This also allows for a few creative liberties, such as a completely superfluous chase scene or a sequence in which Scrooge is suddenly really tiny and running around a huge room. Unfortunately, as good as the animation is, it never quite manages to bring any of the characters to life and the film fails to connect on an emotional level as a result. The film also drags horribly in the middle section (despite attempts to liven things up with chase scenes, etc.) and is frequently dull, whilst the scarier moments might prove too much for younger children. However, the biggest problem is a strangely disappointing performance from Jim Carrey, who underplays it throughout (perhaps wary of comparisons with The Grinch) and ends up delivering a muttering, nondescript Scrooge that could have been voiced by anyone. This is further compounded by the character design, which errs on the side of crotchety old miser and ends up looking more like Albert Steptoe than Jim Carrey. Where are the Muppets when you really need them? Despite some technically impressive animation, Disney’s A Christmas Carol fails to breathe any life into the story and is ultimately something of a disappointment.